But it could have been a seventh straight success had top scorer Lee Ndlovu’s late effort gone in instead of hitting the woodwork. Saints remain third, two points ahead of Bradford Park Avenue who also drew. In a game of few chances at either end, Southport enjoyed more possession at Haig Avenue and had the better opportunities in each half through Jordan Archer and Dion Charles before Ndlovu’s late effort almost won it for Kevin Wilkin’s side. Southport started well and Archer was denied by keeper Danny Lewis as he tried to convert a free-kick from Jordan Richards. Another deep cross from Richards found the unmarked Archer but he headed over from a good position. 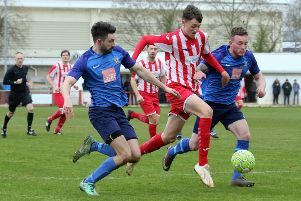 Central defender Matthew Platt was also off target with header before Saints had an effort ruled out for offside when Carl Baker converted a cross from Shane Byrne. After the restart, Saints went close when Connor Hall shot straight at keeper Dan Hanford who then comfortably dealt with Byrne’s volley. Charles created an opening for himself but he was denied by Lewis before Ndlovu spotted Hanford off his line and chipped the stranded keeper only to see the ball bounce up and on to the bar.